Well, here we are, week two of a budding recording article series. Last week I documented a few low to no cost recording solutions, including the use of Audacity. So, how’d it go? Basic audio recording techniques should be quite smooth, however as we’re all aware, sometimes technology has something different to say. In this week’s article I’d like to cover some basic editing techniques that can help make your basic recordings sound more than basic. To do this we need to get some terminology under our belt. We will constantly be looking at new terminology, so it may be advantageous to keep notes on the terms used. This week I’m going to cover a few items to get your recordings a little louder and bring out nuance. At this time I’d like you all to open up your recording software, pull out your guitar and record a basic chord progression. It can be as long or short, basic or complex as you’d like. For the sake of providing examples I’m going to be doing the same. I’ll be using Audacity and my laptop’s built in microphone for posterity. NOTE: Always tune whatever instrument/s you are using for recording before you begin. Although programs such as Autotune can correct pitch problems, it’s much easier to address these issues by playing an instrument that is properly in tune. Okay so now we’ve got a small chord progression recorded. If you’re using a recording system like what I’ve used for my examples you’ll probably notice a few things that detract from the recording. The very first thing you likely notice is the hiss and background noises. Unfortunately without a dedicated audio input setup, proper mics and a room with a low noise floor, this is something that will be evident in your recordings. There are ways around this and I will touch on them a little later in this article and forthcoming articles. The second thing you likely notice and what I’m going to cover now is the volume level. Especially if you’re recording via direct line from an electric guitar, you might find you’ve got a quiet recording. Now, there’s two camps on this subject and each makes valuable points. Most modern recordings attempt to achieve as much audio amplitude as possible. Loud songs get noticed, that’s a fact. However, that’s not to say that having a loud recording makes the sound quality better than a quiet recording. However there is a point where too loud, or too quiet becomes detrimental to your recording. It doesn’t matter how good your recording is if you can’t hear it or vice versa if your recording is so much louder than everything else that you’re constantly turning the volume down. Where does this leave us then? Well to be honest with you it’s personal preference. I will state that if you want to put your music out to the masses, I would lean towards the loud end. So, lets get loud. Amplitude in music refers directly to the signal output of a project. Whether that be a single track recording or a multi-track mix down. If you’re using the Audacity software, your master output meter is located at the top of the window a little offset to the left. Audacity’s output meter measure in negative decibels, as does all other audio output meters. This means that 0.0dB is your top output threshold. Audio that peaks above this 0.0 level enters into audio clipping. The further above this level the more apparent this clipping will be. Imagine your audio project is a lawn and the decibel limit is your lawnmower blade. Anything above the blade gets cut off and everything below it is fine. As you could imagine, this cut doesn’t sound good. As such we avoid it at all cost. NOTE: One requirement of having a project pressed to CD, LP or distributed through digital media is that the audio is free of clipping. How do we get there though? The first step is normalization. 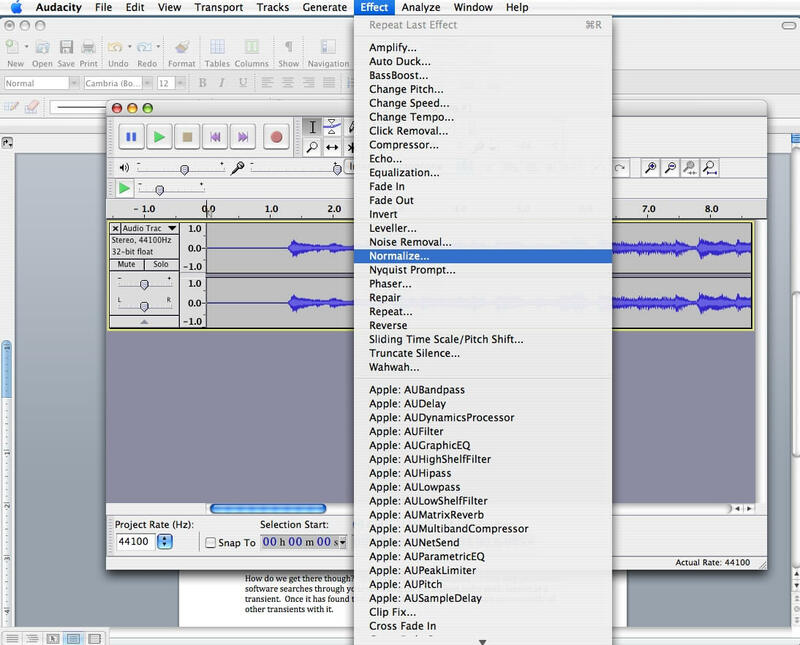 In this step your audio software searches through your recording for the highest audio peak, known as a transient. Once it has found this source it brings this transient and consequently all other transients with it. To normalize your recording navigate to your toolbar, click on effect, then select normalize. You will be confronted with a box with a few options. For the time being select “Ok” without changing any of the default options. We’ve now increased our output level to 0.0 at the largest peak. You’ll probably notice however that this simple audio edit didn’t really increase the average output level by much. You may even be disappointed in the amount of volume increase. This is because the rest of the recording is probably many decibels below that largest peak. That brings us to the next tool in our arsenal, compression. But, what is compression? Although the term does speak for itself, it doesn’t really tell us what exactly it does. Think of compression as squishing and pulling. Based on a ratio of our choosing a compressor squishes the loud portions of a recording, then pulls the entire signal out with it. Creating an overall loudness. It also has the secondary benefit of accentuating subtle details in a recording that may be desirable. On our recording, lets start out with a pretty standard 2.0:1 compressor. 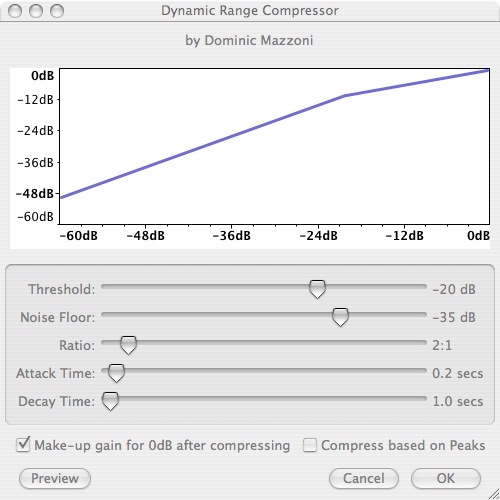 Again, access your recording, navigate to your effects menu and choose compressor. After doing so, you’ll be confronted by a window with several options. I’ll be covering compression in depth in a later lesson, so for this purpose I’d like you to match the values shown below. You’ll notice now that the overall track volume has increased quite significantly. Those nice human touches like pick strikes on the body, and string slides have also been accentuated. These aren’t always desirable, but it’s common in acoustic music to accentuate these items. Unfortunately because we squeezed the entire audio signal and brought it up we also increased the level of that nasty background hiss. As with nearly all audio edits there is a give and take, which has to be taken into account. Fortunately for us, for every negative artifact we generally have a tool to fight it. In this situation we will have to use EQ and filters to reduce and eliminate that additional noise. That however is a more advanced topic that I will cover in the future. Once again I’d like you all to spend the next week recording more of your playing and applying these simple edits to them. Let me know what you’re struggling with and what you’re having success with. Until next week, happy recording!